The female convict in this double portrait wears a light-coloured, loose-fitting, informal garment known as a ‘Bed gown’, or wrapping jacket, with elbow-length sleeves paired with a dark skirt, or petticoat.The Bed gown typically reached mid-thigh with pleated or shaped fullness at the hip and a short skirt cut in one with the bodice as shown in this image. It was usually only held in place at the neck, its V-neckline filled-in with a neckerchief or ‘fichu’ draped, pinned or tied over the breasts. The convict woman’s short petticoat reveals her ankles above buckled and heeled leather shoes and she wears a tall, high-crowned hat with a wide contrasting band of ribbon around its base, trimmed with a ribbon rosette, placed at a jaunty angle over her muslin cap and natural curly hair. Fancier versions of the bed gown could be worn in very informal circumstances by the higher classes (e.g., in one’s boudoir), but it was primarily a garment of working women and the lower classes throughout Europe at this time, who wore it as ordinary daily clothing. Toward the end of the 18th century, the bed gown and petticoat was gradually superseded by the one-piece, ’round’ gown. The male convict in this double portrait wears a practical type of short jacket, with a stand collar, cuffed sleeves and slit pockets, made with a minimum of cloth in a dark, serviceable colour (perhaps brown or blue). He wears a short, light-coloured straight cut waistcoat, half-fastened (14 buttons) over a light-coloured shirt with a neckcloth wrapped around the neck. His loose fitting, light-coloured trousers end above the ankle, revealing buckled leather shoes. His tall crowned hat sits at a rakish angle above his tousled hair which may also be tied back. In the first years of settlement, both convicts and free working-class people wore very similar kinds of clothing consisting largely of basic, ready-made ‘slops’ – the commonly used term for any type of coarse loose-fitting readymade clothing. Uniformly similar in appearance, ‘slop’ garments probably resembled the drab clothes worn in English prisons but were also standard dress for much of the urban working classes at the time. 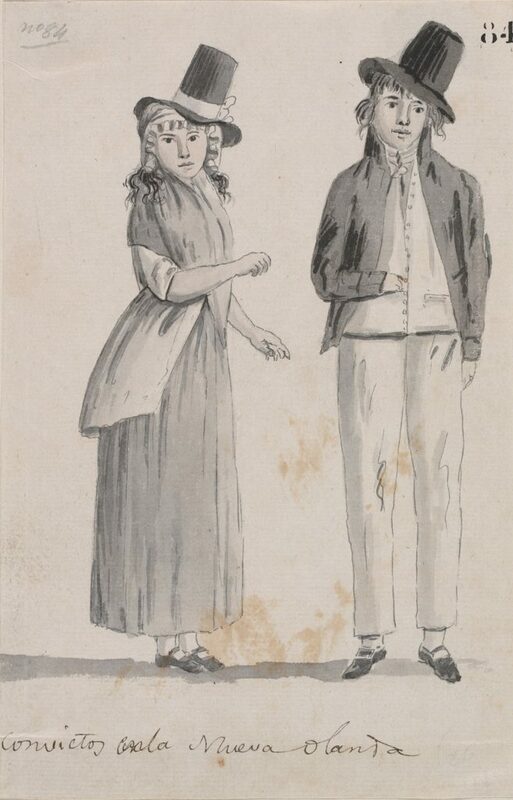 Convict men were issued with short jackets, check frocks, trousers, check shirts and tall crowned hats; women were issued with jackets, petticoats (skirts), kerchiefs, caps and hats. Clear categories of distinctive convict dress or uniform were never satisfactorily enforced in the colony, due to irregularities of supply and further exacerbated by non-standard types clothing issued to convicts on assignment, making discipline difficult to maintain. This image is believed to originate from an album of drawings belonging to Felipe Bauza (1764-1834) who sailed to New South Wales in 1793, as part of the Spanish Scientific Expedition (1789-94) to Australia and the Pacific, under the command of Alessandro Malaspina. The Spanish navy arrived in Sydney on 12 March 1793, to observe the British settlement, and departed a month later on 13 April. Bauza made several sketches during the expedition but these images could also be the work of José Cardero, a young, self-taught artist, who joined the expedition in 1791. In 1962 Bauza personal collection (gathered unofficially and perhaps secretly during the voyage) was offered for sale, and a few of the drawings relating to Australia were purchased by the SLNSW for the Dixson Galleries (Sydney Morning Herald, 7 April 1962, p.14). Among the works acquired were these two drawings, described at the time of their purchase as ‘Australia’s first fashion pictures’.